blogProFilm.ru » Ready Player One – Are Ya Ready, Kids? Ready Player One – Are Ya Ready, Kids? Fantastically attractive virtual worlds, bare-boned devastated reality, adventures and endless horizon for imagination – all this can be easily packed inside a good book. That is why I was a bit suspicious about screen adaptation of Ernest Cline`s Ready Player One. The book filled with sultry links to 1980ies` pop culture up to full capacity seemed unreal not only due to its plotline, but also in terms of screening-ability, let`s put it this way. A reader is not limited in his fantasy, each person interprets the author`s style and context in a unique way, while the film sets the exact visual frame and shapes its own reality. Luckily it was Steven Spielberg to take the helm, and, with a dream team of brilliant cast and his talent to ignite the screen with any fairytale he managed to create the film that deserves all highest rankings. The director faced a challenging task of unifying the Ready Player One characters to satisfy both fans of Ernest Cline`s book that was published in 2011, and his own fans. There was a threat of dividing the audience into two camps – bookworms vs. cinematic geeks – but Spielberg has chosen the right strategy: once cannot resist the movement, take the lead! So he made a brand new story, linked with the original one only by the idea and the characters. Sure, the plotline turned out to be easier, and there is less links on screen as it initially were quilted in the novel, but the filmmakers have repeatedly noted about difficulties with obtaining the rights for using these or those famous brands. On the other hand, dynamics and stunning visual effects of the film proved to be off the charts (more than two hours smoothly goes in one sitting), and the story of searching the ‘Easter Egg’ inside the virtual reality took the shape of searching ‘Easter Eggs’ inside the story of searching the ‘Easter Egg’. The most attentive ones are already competing in amounts of the links found. However even those who are not much about the 1980ies pop culture will be nostalgically glad to see the scene with reconstruction of The Shining, the Hot Wheels style curly racing track, legendary DeLorean of Back To The Future, a magic ‘Zemeckis Cube’, and to capture Batman, King Kong, a Rush! poster, Billy Idol`s LP, a Sharp stereo, a Joy Division T-shirt, a fragment of Minecraft, Clark Kent`s glasses, contours of an X-Wing and a Millenium Falcon reference in the film. Not to mention the soundtrack! Spielberg has made his film to involve the audience in watching attentively in pursuit of his own ‘Easter Eggs’, catching the details, guessing the hidden images on the screen instead of just seeing the movie about the good ones and the bad ones. ‘This story is straight ahead out your windshield, and the cultural references are simply in your peripheral vision’, – that`s how he described his idea to the USA Today. A tricky task for the audience to be the driver and the passenger at the same time, but anyhow the film is worth watching more than one time. The story is set in future, but mostly in the virtual world called the OASIS – the symbolic name for a place to escape from the shattered reality. All people have their virtual avatars, sometimes looking strikingly different from their real prototypes. Although we see graphics instead of real actors more frequently, the cast has demonstrated a true teamwork and complementarity: everyone looked like unique pieces of a jigsaw puzzle and altogether shaped the amazing show. Young actors of the High Five, the team of ‘Easter Egg’ hunters – Tye Sheridan, Olivia Cooke, Lena Waithe, Win Morizaki and Philip Zhao – has done a great job. Some may say that it`s easy to play kids and teens, it`s like being yourself. But for a Steven Spielberg`s adventure movie there`s something more needed than just meeting the age requirements. Emotions, charismatic look, drive, and breathing life into virtual avatars – I was glad to see that the young stars handled it pretty well. After many serious roles it was surprisingly wonderful to see Mark Rylance portraying the digital genius James Halliday obsessed with his own creation. An introvert drown in his own insecurities, a little bit coocoo, Halliday appeared to meet all the features Ernest Cline had described in the book. All these geek T-shirts and denim jackets, baggy jeans, nest-styled hair and blank look with warm and kind folly – that`s that Halliday you imagine while reading the novel. Simon Pegg accompanied him as Halliday`s best and only friend who turned a technology into profitable business and business into a popular idea, which went worldwide popular and was available for everyone depending only on the Internet connection. I can`t avoid saying a few nice words to sweet guy Ben Mendelsohn who played another antagonist. This fact should not dust your eyes, his role in Ready Player One has nothing in common with predictability and ‘bad guys’ he played before. His character – Nolan Sorrento, a company`s boss, ladder climber and office drone, could have seemed boring if the actor has not wrapped him into a humorous foil, even adding some soul in this image. His Sorrento appeared to be a fabulous lamebrain, totally in love with himself, all puffed up but inevitably screwing up. Such a ‘guy with wounded vanity who ended up finagling his way into becoming a master of the universe and wants everyone else to pay for it, basically, you know, just a dickhead’, as Mendelsohn told Daily Telegraph Australia about his character, as usual, in a relaxed and informal way. Some statistics: by the way, this ‘bad guy’ role has brought Mendelsohn a kind of a record (or anti-record). He has already played antagonists in the universes of DC (The Dark Knight Rises, 2012) and Star Wars (Rogue One: A Star Wars Story, 2016), at the top popular streaming media Netflix (Bloodline, 2015 – 2017), in Steven Spielberg`s blockbuster, and now it`s Marvel`s turn (Captain Marvel, 2019). I can`t even imagine what`s next but wish Ben all the best in any handsome crazy stuff he is doing or plans to do! All in all, the new Steven Spielberg`s film lefts a very positive impression, and, opposing to some critics` prejudices before the opening, it doesn`t seem like an attempt to save ‘youth adventure’ movies. Sure, the plotline itself is quite close to a mixture of Equilibrium and The Hunger Games: passion for overwhelming idea developed to an idiot box extent, addiction to the virtual reality, spirit of the competition, struggle of clans and solo hunters in search of Halliday`s ‘Easter Egg’ inside an imaginary world. But Spielberg made all this shine with captivating vibes – or could Spielberg make it the other way? 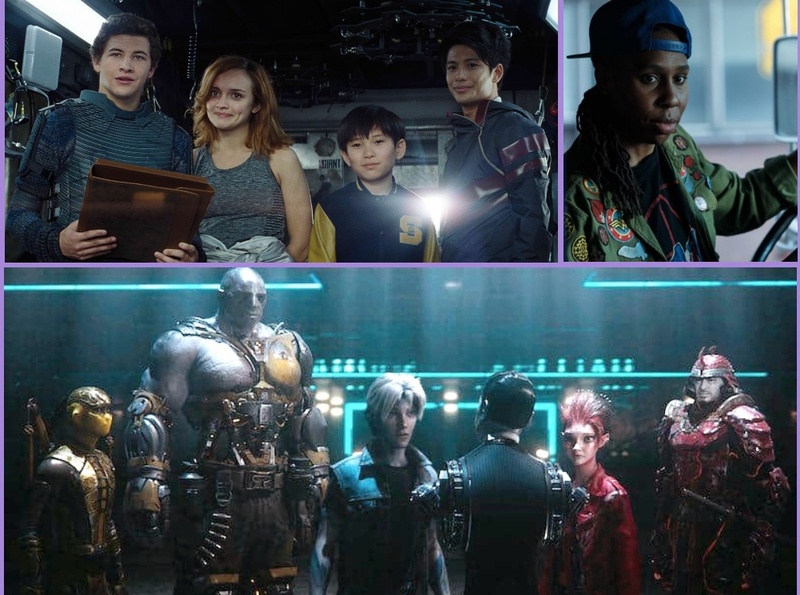 There were a number of fantastic, adventure and sci-fi movies recently, where the main parts were played by teens and youngsters (like The Maze Runner trilogy or Valerian and the City of a Thousand Planets), but they had no path to massive pop culture yet. Ready Player One has all chances to get the treasure keys of audience`s approval. Except positive acceptance and high critical rating there is another proof: it is very likely that Steven Spielberg and Warner Bros. that purchased the screening rights long before the book was published are already considering the opportunities of expanding the project and launching a franchise, since Ernest Cline has announced that he plans to write the next part soon. So, Ready Player Two, are you ready?